Congratulations to our Rongotai Sailing team who competed against the top schools in New Zealand over the weekend and placed 4th in in the National Secondary Schools sailing regatta in Auckland. The team consisting of Wilbur Stanley, Albert Stanley, Harvey Linton and Hugo Nevin-Matterson, were just pipped for 3rd place by Kings College on the final day. The 18 round event involving the top 11 schools in the country is a prestigious event and the breeding ground for a number of top New Zealand sailors who have gone on to compete at the Olympics and America’s Cup over the years. Congratulations to the Rongotai Softball side who qualified for the final of the Wellington Regional Softball champs with a 4 game winning streak before going down in a tight final 6-4 vs St Bernard’s. Both sides will compete in nationals in Christchurch later this month. 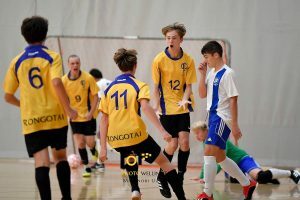 The CSW Regional futsal Champs was also this week with both the junior and senior sides doing extremely well and making the finals in both grades. The Juniors went down 3-1 to St Pat’s but our Seniors won the Wellington competition with a good 1-0 win against Wellington College, thanks to a goal by Lucas Bertos. Well done to all the boys who were selected to compete in the Regional athletics champs yesterday at Newtown Park – Bilaal Adam, Zayd Adam, Bevan Cox, Jude Sneddon, Jason Fa’amasuili, Jaiden Kesry, Setefano Solo, Pose Tuilaepa, Mahonri Tumanuvao, Mikey Tutaki. A big shout out to Bevan Cox who took 7 seconds off his personal best in the 1500m. In regular weekly competitions, there was no cricket on the weekend die to the rain. The 1st XI travel to play Wairarapa College in Masterton, needing to win to guarantee a top 4 place in the Premier 2 competition and play off for promotion in Term 4. 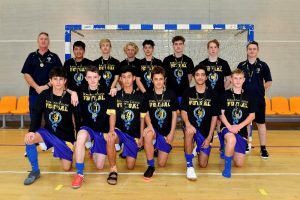 The Junior A Floorball team drew 3-3 with Wellington College last night, while the Senior A team played two games drawing 4-4 with Wellington College before beating Scots 8-4 in their second match of the night. Also on Thursday night, the Rongotai Water Polo side had a big win against top of the table, and Water Polo heavy-weights, Palmerston North Boys’ High School 10-6 in the lower North Island Competition. Well done boys!! The senior Volleyball side lost by default on Friday and will play for 7th and 8th this week. The Juniors lost 3-2 against St Pat’s Wellington. The regional tennis tournament was postponed on Wednesday due to poor weather and will now be played next week. However, the Rongotai A tennis side won 3-0 against Hutt Valley High School in the weekly tournament. In lawn bowls, the Rongotai A side lost to the Rongotai C side 14-9. A reminder that sports registrations close in 2 weeks and all boys must be registered and paid. Automatic payments can be set up at the college office. Also don’t forget you should all be checking the morning notices each day for information regarding trials and other important information. Basketball trials are already underway. 1st XI football trials are next Tuesday and Friday. Trials for other football teams and hockey will be advertised in the morning notices.